An ivory group of figures, carved from the tip of a tusk. It is composed of a mother, a boy and a puppy, together on a lotus base. The mother has her right arm half raised, holding a branch of lotus flowers that extends over her head, whilst her left hand holds a folded umbrella, the tip of which rests on the ground. She is dressed in layered robes with long sleeves that are overall adorned with diamond patterns. Her hair is carefully arranged into a backward chignon, revealing her delicately carved face with demure expression. The boy is dressed in a long jacket over trousers and holds a flower blossom in each hand. The puppy is carved in a half-standing posture, looking up and playfully putting its front paws on the left knee of the boy. Its hairy body is minutely incised with fine lines. The figures are each carved in the round with dynamic movement. The base is plain and shows the fine texture of the ivory. 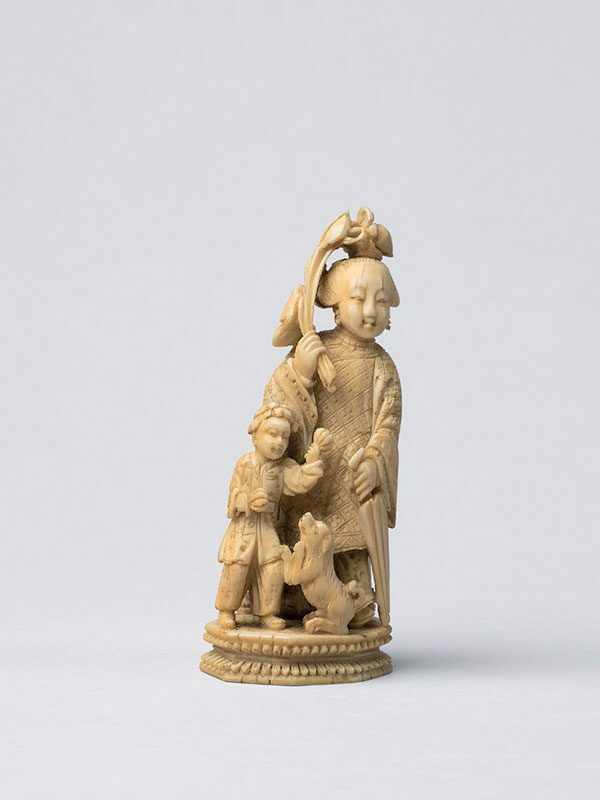 This ivory group of figures does not have the usual religious theme but instead depicts vivid family life of the Qing dynasty. It shows the intricate technique of the Guangdong craftsmen and was made as an export product in the late Qing dynasty. The depiction of maternal piety and family harmony is reinforced by the presence of a puppy. Dogs often appear in scenes of family settings and symbolise prosperity and procreativity. 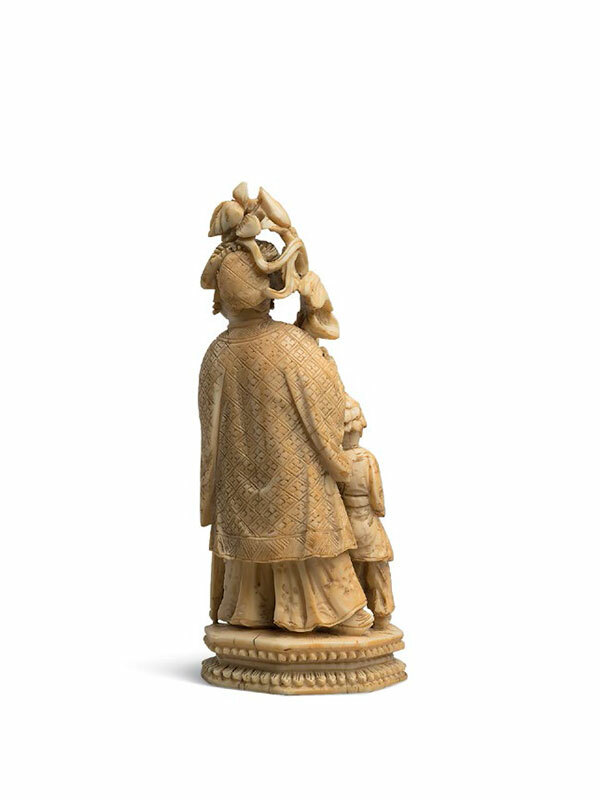 A comparable ivory group of figures, depicting a half-naked woman holding a small boy on a table in front of her whilst a puppy crouches underneath the table, is dated to the Qing dynasty, 19th – 20th century and in the Sir Victor Sassoon collection.